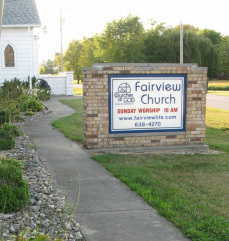 Fairview is a member of the Churches of God, General Conference. We are located south of Fort Wayne, Indiana at the corner of Yoder and Smith Roads, 1.5 miles south of I-469 and 2 miles west of State Road 1 (Bluffton Road). Please see the "Contact Us" page for more information.